Jack Nicklaus is partnered with Gary Player and Lee Trevino at the Insperity Invitational’s Greats of Golf event on Saturday. The Golden Bear, the Black Knight, and the Merry Mex will be bringing nine of their friends for a return trip to the Insperity Invitational presented by UnitedHealthcare for the sixth annual 3M Greats of Golf competition on May 6, 2017. Patrons of the PGA TOUR Champions event at The Woodlands Country Club Tournament Course in The Woodlands, Texas, will have a special opportunity to see 12 of the greatest legends of the game tee it up in a memorable exhibition round, which has become a Saturday afternoon tradition at the award-winning tournament. Jack Nicklaus, Gary Player, and Lee Trevino will play in an 18-hole scramble format against three other newly-formed teams composed of Dave Stockton, Hale Irwin, and Charles Coody; Tom Weiskopf, David Graham, and Tony Jacklin; and Fuzzy Zoeller, Ben Crenshaw, and Bill Rogers. 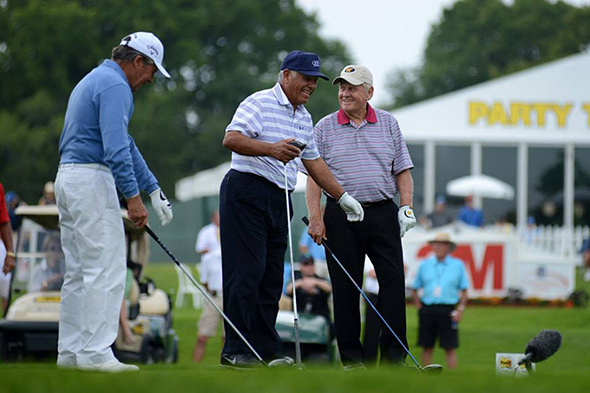 The Greats will tee off between 1:30 and 2:00 ET, with the Nicklaus team going off last. Tournament coverage Saturday is from 2:30 to 5:30 ET on Golf Channel. The trio won the event with a two-shot lead in 2015, but last year, lost to a team made up of Hale Irwin, Ben Crenshaw, and Dave Stockton. “We ought to put an age limit on it,” Player joked. Responsible for the birth of the PGA TOUR Champions, the 12-pack of golf legends has combined to win 173 times on the PGA TOUR, including an unprecedented 49 major titles. They went on to capture 105 more victories, including 30 major wins, on the back nine of their careers while teeing it up on the senior circuit. For his share, Nicklaus won a record 18 professional major championship titles, and he remains the only player to have completed the career Grand Slam on both the regular and senior tours. His eight majors on the senior circuit, now called the PGA TOUR Champions, remain a record. Admission to the tournament is free on Saturday courtesy of Woodforest National Bank. The first thousand fans through the main gate will receive a tournament-logoed hat that pays tribute to Arnold Palmer. For its concurrent PGA TOUR Champions event, The Woodlands Country Club Tournament Course will welcome 79 players representing 13 countries around the world, spanning across North and South America, Europe, Africa, and Oceania. This year’s field, which features seven World Golf Hall of Fame members, has combined to win 343 times on the PGA TOUR, including 25 major victories. They also bring with them to southern Texas a total of 233 victories on the 50-plus circuit including 44 PGA TOUR Champions major titles. The impressive lineup of the game’s greatest names also includes defending champ Jesper Parnevik; Fred Couples; Mark O’Meara; Tom Kite; Colin Montgomerie; Mark Calcaveccia; John Daly; Fred Funk; Jay Haas; Tom Lehman; hometown boy Jeff Maggert; Rocco Mediate; Corey Pavin; Kenny Perry; Esteban Toledo; rookie David Toms; Ian Woosnam; and Spain’s Miguel Angel Jimenez, who is making his first trip to the Insperity Invitational. The only invitational format on the PGA TOUR Champions provides players eight categories of eligibility to compete in the prestigious event.